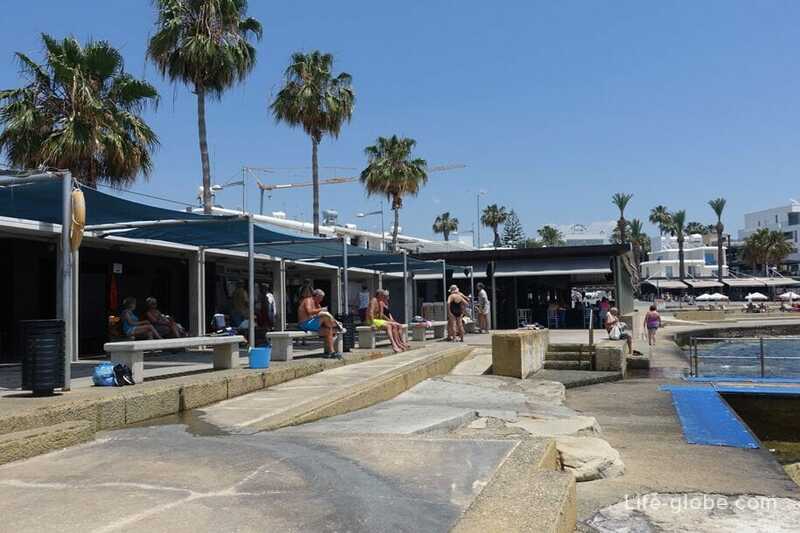 Beach Municipal Baths or simply municipal beach "Baths" is one of the main beaches of Paphos, located in the heart of the coast of Kato Paphos. 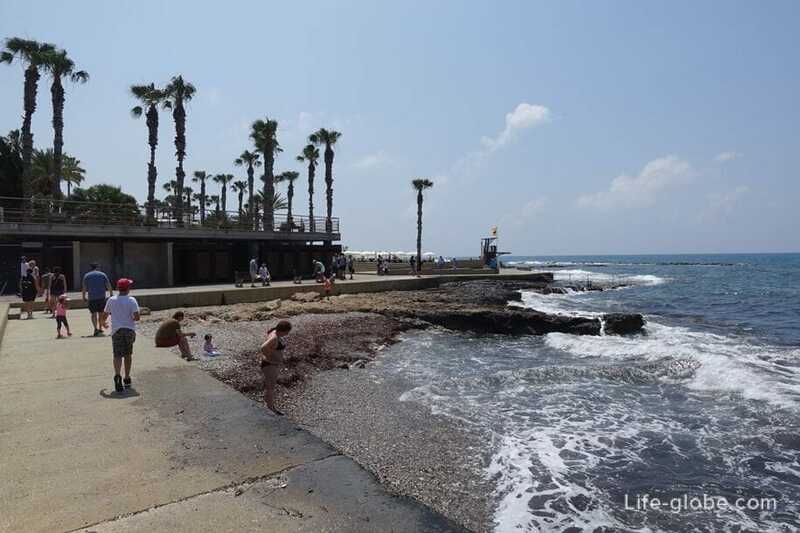 The Municipal baths beach is surrounded by the main embankments of Paphos. 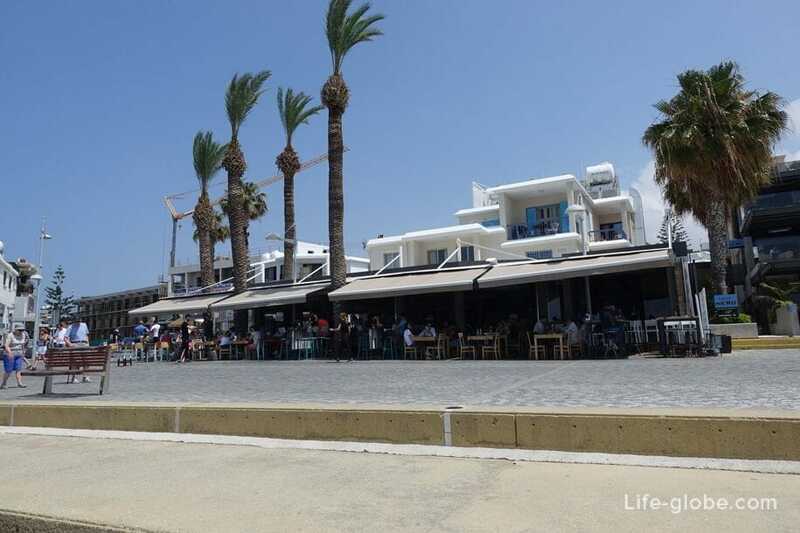 On the one hand it is facing the waterfront of Kato Paphos Poseidonos Avenue, and on the other on the promenade of the Coastal Broadwalk, where it borders the beach of Alykes. 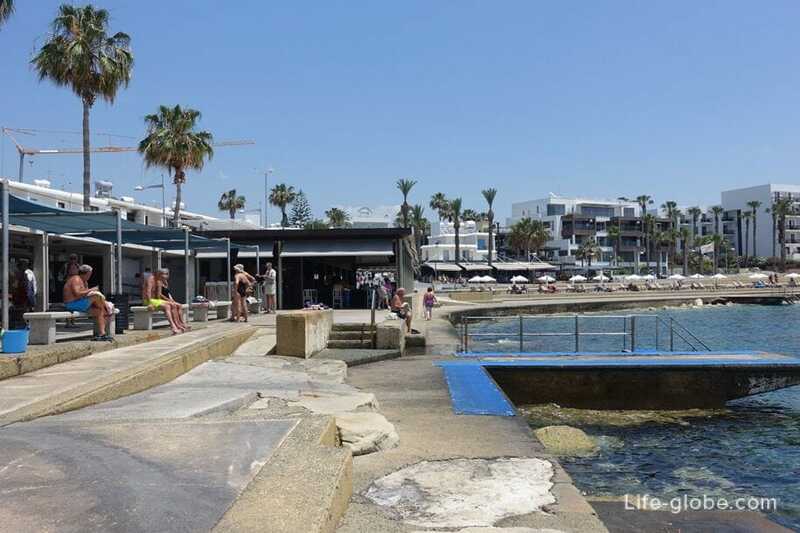 Beach Municipal Baths and has been awarded the "Blue flag" - a sign of purity and quality of the beach and sea water. 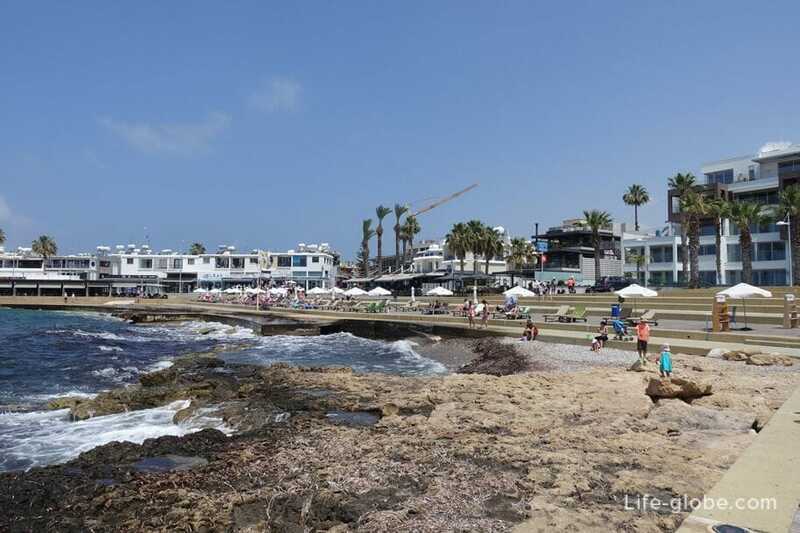 The beach has a length of 100 meters and stands out from the usual concept of the beaches of Paphos, there is no sand nor shingle strip and convenient entry into the sea. 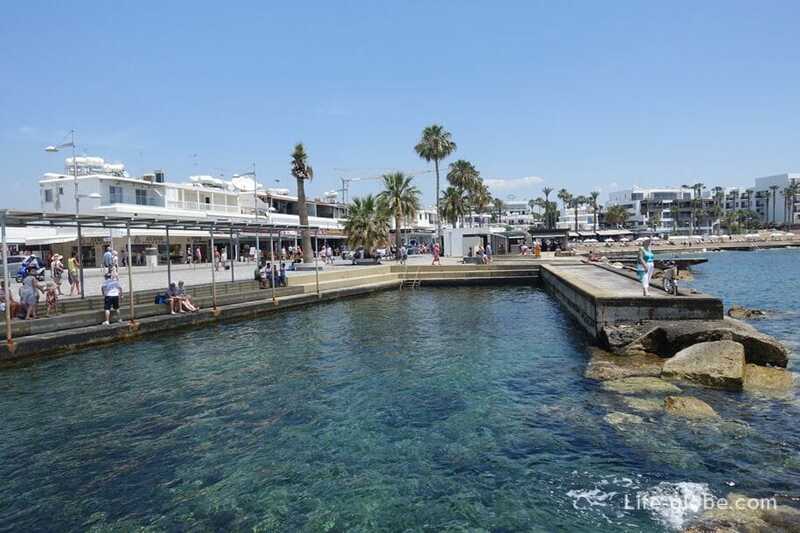 Concrete beach with a wide wooden deck and concrete piers equipped with ladders, for a more comfortable descent into the water, externally, may resemble a bath tub, which got its name of Municipal baths or baths beach on the boards. 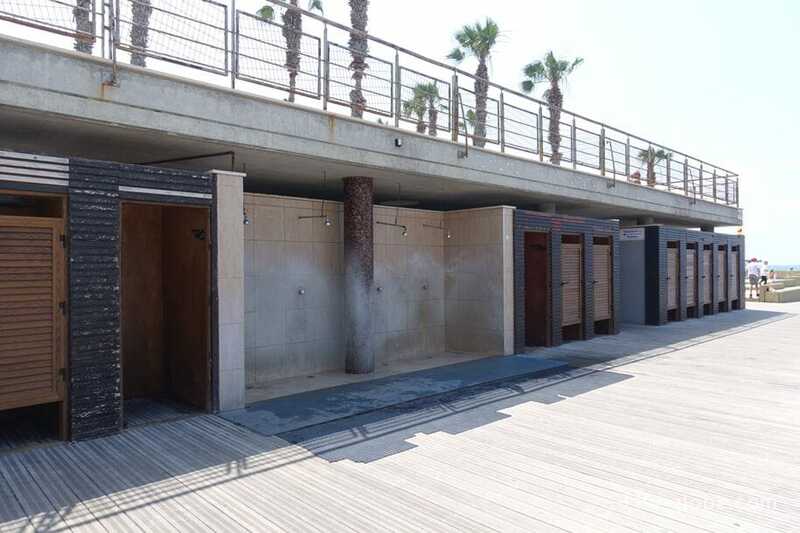 In the high tourist season on the beach there is all necessary infrastructure: sunbeds and umbrellas, toilets and showers, rubbish bins and changing rooms, rescue tower. Lifeguards with lifesaving equipment and first aid are on the beaches from April 15 to October 31, from 11:00 to 17:30 hours. The cost of renting a sunbed or parasol - € 2.50. 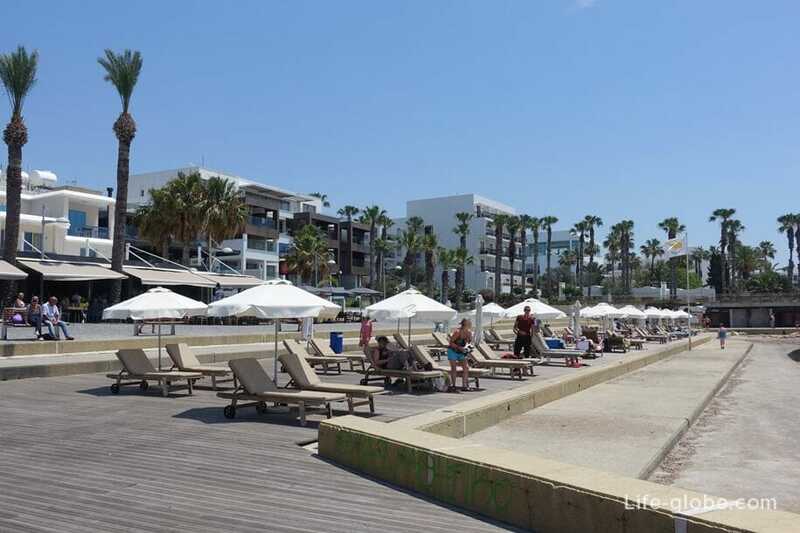 Close to the beach, a dedicated area for water activities, there is also Parking, plenty of cafes and restaurants. 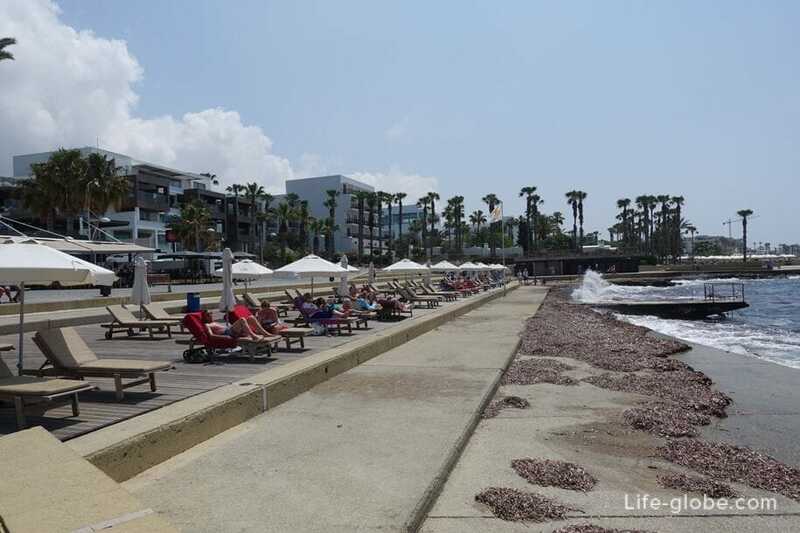 On the South side of the beach is small pebbled area, with direct entry into the sea. - 5-star Annabelle Hotel with tropical landscaped gardens surrounding a large pool with caves and waterfall. Each room has a Minibar and free Wi-Fi, bathrobes and Slippers. The room price includes Breakfast or Breakfast and dinner. 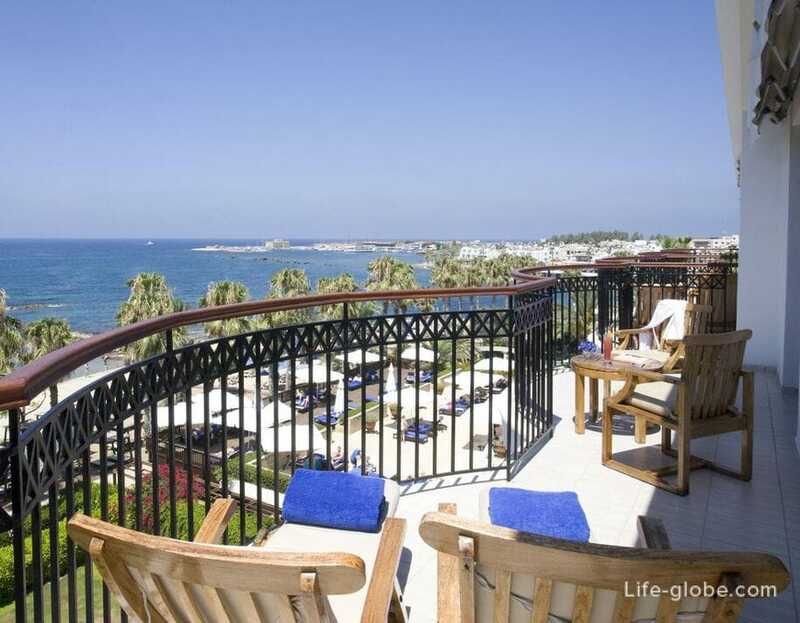 - Apartment Seaside Luxury Flat: 53 Lighthouse with sea view, bar and balcony. Amenities include: air conditioning, fully equipped kitchen, a dining area and a flat-screen TV. 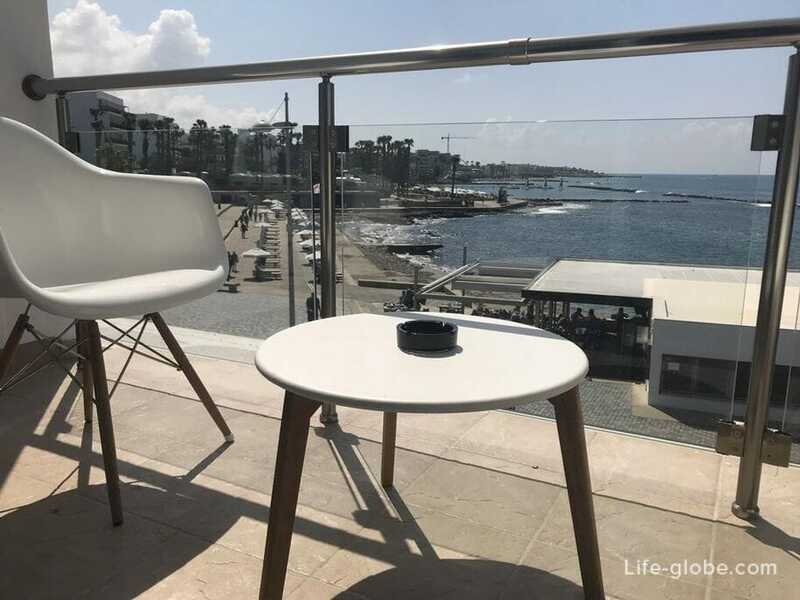 - Apartment Noma Suites with a balcony and free Wi-Fi. 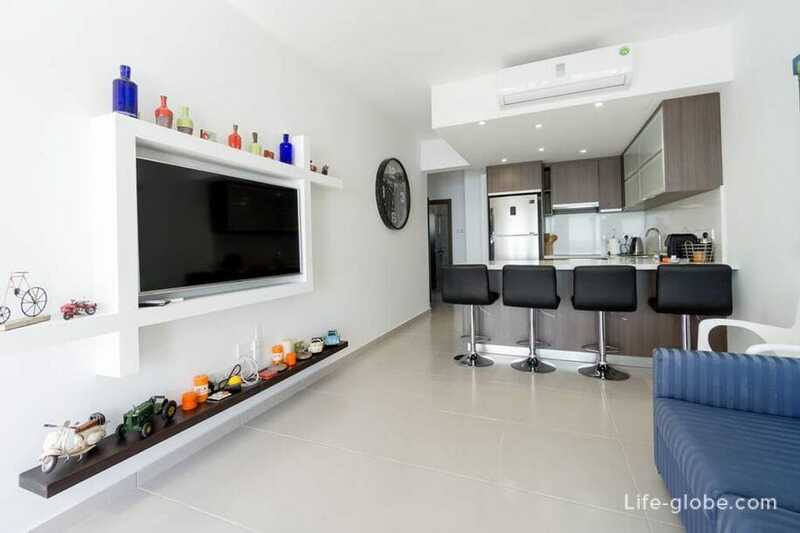 This apartment features 1 bedroom, a fully equipped kitchen with a refrigerator and a bathroom with a bathtub. - The 3-star Dionysos Central with swimming pool and terrace equipped with sun loungers. The bright, air-conditioned rooms feature a TV with satellite channels. 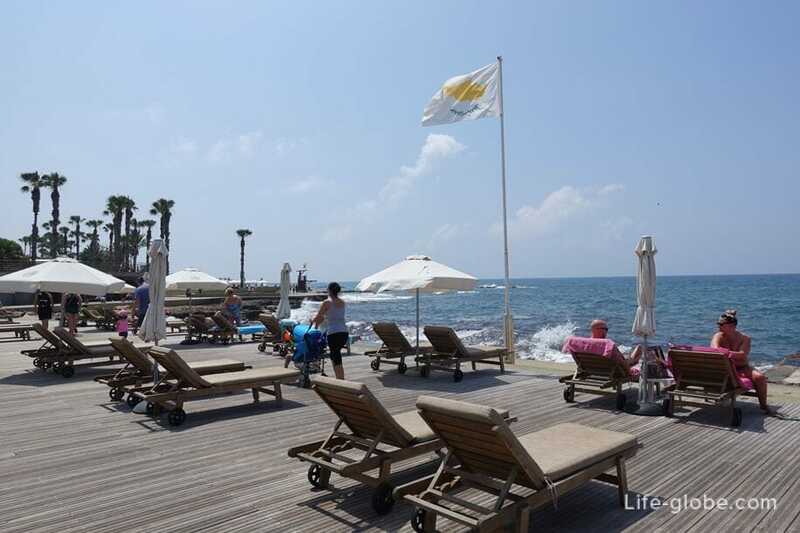 The restaurant and the pool bar serves hot and cold beverages, French pastries, crepes and salads. The Italian trattoria serves a buffet with a wide selection of pasta and pizza. Room rates include Breakfast.